Shell companies in the Philippines wins best photo award in the American Chamber of Commerce of the Philippines’ (AmCham) 6th Corporate Social Responsibility (CSR) Photo Competition for the entry, “Wired for Success” taken from Sanayan sa Ikauunlad ng Kaalamang Pangkabuhayan (SIKAP)—a social investment programme of Malampaya Phase 3. “Wired for Success” bested a total of 116 entries from 23 AmCham member companies. Shell Philippines Exploration, B.V., operator of the Malampaya gas project, entered the SIKAP program in the prestigious photo competition. 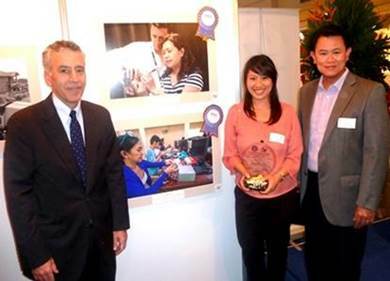 Shell has consistently won best photo award and some entries included in the roster of finalists in the AmCham CSR Photo Competition since 2011. Implemented by Malampaya Foundation, Inc. (MFI), SIKAP is a capacity-building program for coastal communities in Subic that offers enterprise development and trainings on computer hardware servicing, consumer electronics, housekeeping, and bartending, among other livelihood trainings. The SIKAP programme was implemented last October, 2013 and has so far benefitted more than 500 residents from Subic coastal communities. Subic is the site of the fabrication of the second Malampaya offshore gas platform that is the first technology of its kind to be built in the Philippines. This second offshore platform will be installed besides the existing Malampaya offshore facility located in the West Philippine Sea, near Palawan. Several entries from Shell companies in the Philippines were declared as finalists and are featured in the AmCham photo exhibition aside from SIKAP. These include Galing at Negosyo Dulot ay Asenso’s (GANDA) “Nasa Kamay Ko ang Asenso” (“I Hold My Own Progress”) and “Mentor-Mentee”; Kaligtasan sa Daan’s (KALSADA) “Stop, Look and Listen”; Movement Against Malaria’s “The Fight Against Malaria is for Everyone” and Shell’s Relief and Rehab Response for Typhoon Yolanda “Setting the Sail for Macatunao Fishermen”. “Winning in the AmCham CSR Photo Competition allows Shell and other AmCham member companies to creatively reach out to people and show that something is being done to address the needs of our less fortunate countrymen and women,” said Paulo Gavino, Shell Upstream Communications Manager. “SIKAP is one of Malampaya’s numerous programs that help the Malampaya Project in its goal to leave a positive legacy in the communities where it operates. This award inspires us to continue strengthening our social programs to uplift the lives of more people as we go through Shell’s next 100 years of doing good and sustainable business in the country and for Filipinos.” Year 2014 marks Shell companies in the Philippines’ centenary in the country. His Excellency Philip Goldberg, United States Ambassador to the Philippines, expressed his utmost appreciation to the AmCham and to all the participating companies for their relentless efforts in improving the Philippines’ condition in terms of the six major areas of development that directly affect the Filipino people’s welfare and social progress, namely on Environment, Education, Health, Livelihood, Peace and Disaster Risk Management. The categories of the competition are the six major areas of development in the Philippines, as stated above. One photo entry is evaluated as the winner per category. 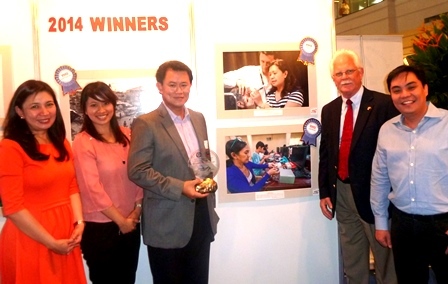 The awarding of winners and ribbon-cutting ceremony was held last September 2, 2014. The Malampaya Phase 3 (MP3) Project’s first offshore gas platform in the Philippines, in combination with Malampaya Phase 2 (MP2)’s additional subsea wells which was completed in 2013, will sustain the level of gas being extracted from the Malampaya reservoir for electricity production, as such maximizing Malampaya’s value in providing reliable supply of cleaner energy to power the country’s growth. Malampaya provides 25-30% of the country’s electricity needs. As a global leader in power, energy and gas technology, Shell seeks to continuously address energy challenges while mitigating environmental impact, through endeavors such as Malampaya. It focuses on delivering smarter products and cleaner energy, smarter infrastructure, promoting sustainable mobility, and developing new energy sources such as cleaner-burning natural gas. 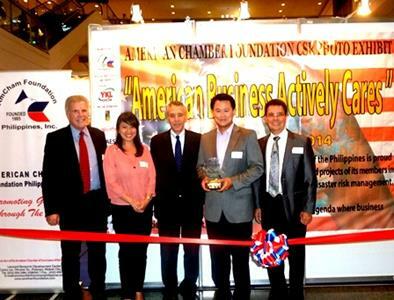 Receiving the award for SIKAP are [2nd from left] Malampaya Project Communications Advisor Christine Guison and [2nd from right] Shell Finance Director Jeng Pascual, from [left to right] AmCham President Rhicke Jennings, United States Ambassador to the Philippines His Excellency Philip Goldberg and AmCham Foundation President Edwin Feist. Taking a photo beside SIKAP’s “Wired for Success” are [from left] United States Ambassador to the Philippines Philip Goldberg, Malampaya Project Communications Advisor Christine Guison and Shell Finance Director Jeng Pascual. AmCham Executive Director Ebb Hinchliffe [2nd from right] takes photo with Shell representatives [from left] Shell Social Investment Manager Jackie Ampil, Malampaya Project Communications Advisor Christine Guison, Shell Finance Director Jeng Pascual and Shell Upstream Communications Manager Paulo Gavino.